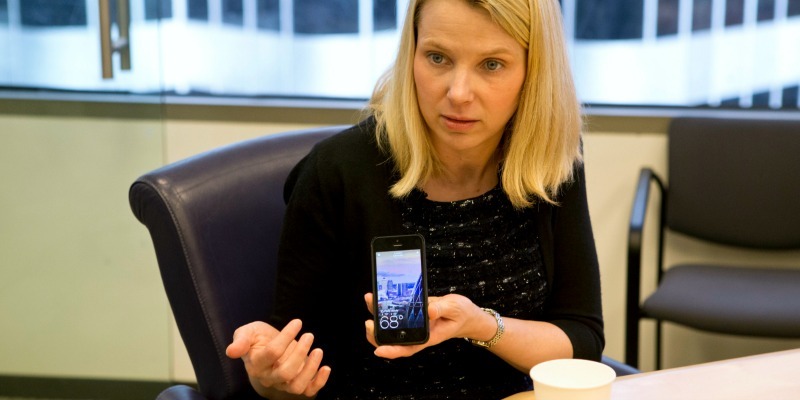 What Is Marissa Mayer Actually Doing? Turning around Yahoo's image was hard. She did it, perfectly. Turning around the business will be harder. Yahoo stock hit another 52-week high—actually, a five-year high—as the backlash against (or, at least, heavy skepticism toward) CEO Marissa Mayer's ubiquity tour continues to grow. Looking at Yahoo today, there are at least two big picture questions: (1) Why does the stock keep going up if revenue isn't growing? and (2) Does the stock's success suggest that Mayer is brilliant, lucky, or overrated? The answer to the first question helps to answer the second question. The irony of the Mayer Stimulus is that much of the stock increase has been driven by investments by the CEOs that came before her. Co-founder Jerry Yang negotiated a 25 percent stake in Alibaba, the Chinese online search-and-commerce juggernaut, which has exploded in the last year and is nearing an IPO. “Most of the enthusiasm about Yahoo’s stock price is a reflection of the company’s investment in Alibaba [the Chinese search-and-shopping giant] and Yahoo Japan,” said analyst Scott Kessler. So, yes, Marissa Mayer has been very, very lucky. Yahoo emerged from a four-year nap just as she took the job, thanks to the appreciation of an investment made years earlier. But luck and skill aren't mutually exclusive. Yahoo is a online-advertising business—search and display—and Mayer understands the most important thing about online advertising, which is that it's moving to mobile and the company wasn't ready for it. Look beyond the $1.1 billion purchase of Tumblr and the glitzy mag and conference appearances, and that's where Mayer's focus has been: Dragging the company into mobile age by updating its email, apps, video, and news portals for ambulatory, non-desktop readers. 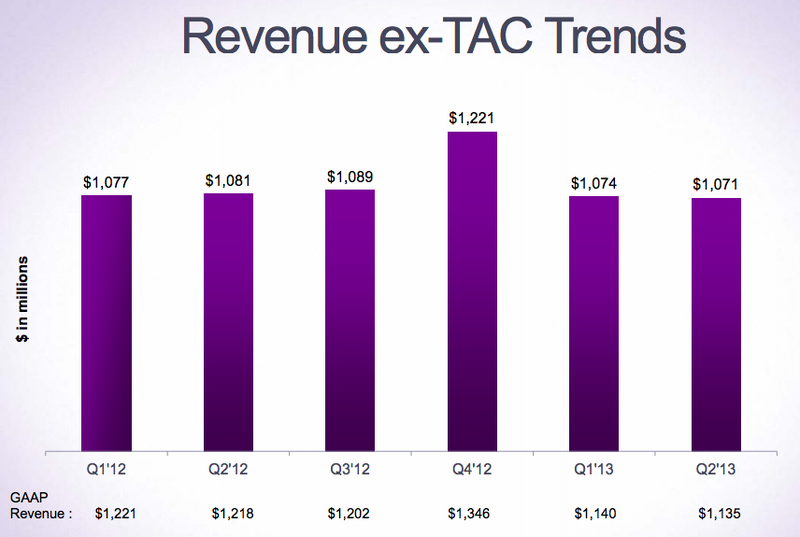 A shallow dig into the financials shows that display advertising -- e.g. : ads running alongside its prodigious news portal -- is facing a long-term decline. Display has fallen 5 percentage points as a share of Yahoo's entire revenue haul in Mayer's first year on the job, even as her loudest moves have been to drive more readers to Yahoo pages that must be supported with display advertising. The upshot is that Yahoo, an original tech hero of the 1990s, has become a singular metaphor for the promise and woes of the industry: So many readers, so little lucre. Facebook and Google together make up nearly 70 percent of the mobile advertising market, with Mayer's company coming in at a distant third. Yahoo has room to grow, and money to spend, but, crucially, it doesn't have a dominant mobile operating system or a universal social network around which it can build an ecosystem for capturing and (ugh, yes, this word ...) monetizing mobile audiences. Google makes the software that powers 50 percent of all smartphones. Facebook has an ingenious one-column-scroll home built perfectly to incorporate native advertising seen by hundreds of millions of people a day. 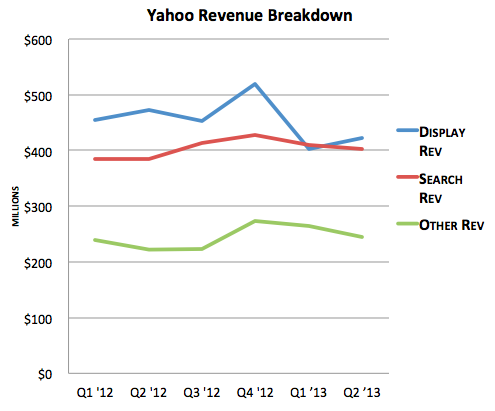 Yahoo has lots of popular sites and apps, but it doesn't have a strategic advantage in systems, search, or social. Turning around Yahoo's image was hard work. Marissa Mayer did it. Turning around the business will be harder.